T-Minus: The Race to the Moon. (9 out of 10) Jim Ottaviani, Art by Kevin and Zander Cannon. Graphic Novel Paperback, 128 pages, black and white. 2009, Aladdin. I recently read Tom Wolfe's The Right Stuff, which was an interesting, nearly-fictionalized retelling of the story of the Mercury 7 astronauts--the first Americans to go into space. I haven't ever seen the movie...I should get around to that. 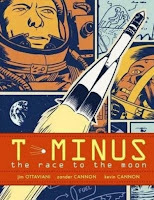 I guess I'm in a Space Race kind of mood, because I just finished Jim Ottaviani's T-Minus: The Race to the Moon. The graphic novel-format book has art by Zander and Kevin Cannon, and is Ottaviani at his best. His graphic novels usually focus on science or scientists, and have classroom connections on every page. Where The Right Stuff focused nearly exclusively on the astronauts, T-Minus is more about the scientists--the brains behind (underneath?) the rockets that were carrying mankind into space. Most Americans just tell the American side of the story. 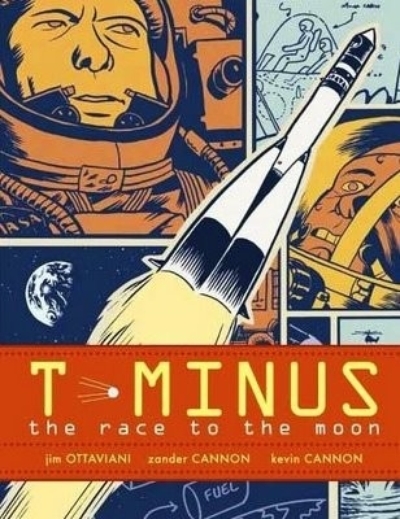 Instead, Ottaviani masterfully interweaves the story of the Space Race between the USA and USSR--treating the competition to get to the moon as another facet of the Cold War, which it of course was. He makes sure we know it really was a race--not just the United States' destiny to be the first ones to the moon. Each new section of the book is chaptered with a date and "T-Minus..."the amount of time between that date and the day and time that Neil Armstrong's foot touched the moon's surface. It's an interesting way to countdown what was a twelve-year period of time, for the United States spanning several presidencies from Eisenhower to JFK to LBJ to Nixon; for the USSR, from Khrushchev to Brezhnev. We get flashbacks to the visions of Russian Tsiolkovsky, who took Jules Verne's ideas about rocket travel and first tried to apply science to them; to Operation Paperclip, which had the United States snagging German scientists after World War II, bringing Werner von Braun to the US to work for our rocketry program. Those are diversions, and most of the book is in chronological order, moving forward to the June 1969 moon landing. Ottaviani and the artists include some features that I loved in the book. When dialogue is spoken in Russian, the Rs are printed backwards, and all As are in lower case, mimicking Cyrillic writing. There were times in the black and white book that it was confusing, remembering which group of rocket scientists we were looking at. The "Cyrillic" helped differentiate that. The other feature is a series of drawings and statistics in the margins of many pages. Each time a rocket went up, from either Russia or the United States, it gets an illustration of the rocket, the name of the mission, duration of the mission, and animals, satellites, cargo or astronauts/cosmonauts on board. There's a tiny image of a map of the US or Russia at the bottom, and if the mission failed, "UNSUCCESSFUL" in a banner at the top of the page, often with an illustration of what went wrong. It demonstrates visually how neck-and-neck the Space Race really was, and the victories and failures on either side of the Iron Curtain. Eventually, the book does transition from the scientists to the astronauts, and we do get a good idea of what it was like to be with Neil Armstrong, Buzz Aldrin, and Michael Collins on the Apollo 11 mission. Despite knowing the end of the story, Ottaviani is able to craft a script with tension and surprise, and Zander and Kevin Cannon's artwork carries that tale beautifully. With the loss of NASA funding, and the failure to replace the space shuttle program, it can be a discouraging time to be a real world space exploration geek. Remember the achievements of the past, and the exciting things like the unmanned probes exploring the solar system. We have a great history in space, and we'll have a great future there as well. It takes the courage showcased in T-Minus: The Race to the Moon to get there.